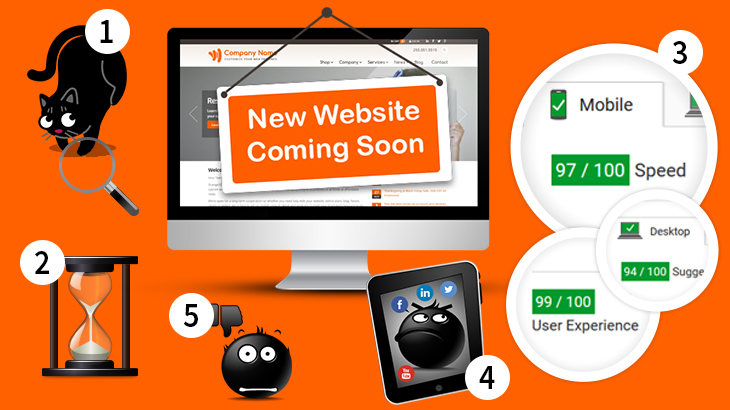 Although there are many reasons for a website change, below, we outlined 5 signs you need a new website. 1. Your website is harder to find than a black cat at night. Something you can do right now. Go to Google and type in your business name. Did you find your website at the top of the first page? How about looking for a main service/product that your company offers? Keep looking… Not until the 5th page? There are many ways to improve search engine results, a lot of the techniques include how your website is structured and programmed, how your content is written, and how your site is described to show up in search engines. Many older websites are not well-equipped with the latest important tools for the search engines, yours may be in the same trouble. Websites have evolved quite a bit over the years. Today, it’s all about clean design and easy navigation. If your site is a cluttered mess or uses outdated techniques, it just looks old, uncompetitive and NOT trustworthy. It’s also important that you can easily adapt and make changes to it as your business changes and grows, it may be a real struggle and thus waste of time and money to support an old website, rather than invest into a new one. According to this statistic, 47% of users expect a web page to load in 2 seconds or less, and 40% of more patient ones will abandon a website when it takes more than 3 seconds to load! 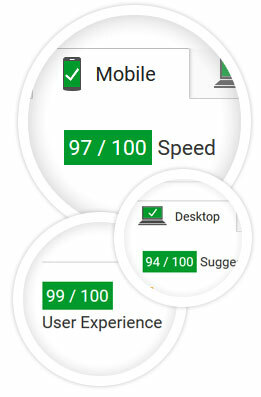 Here’s what Google says about platform we develop websites for our customers with: Orange35 CMF PageSpeed (see screenshots to the right), much better isn’t it? Our team can help you achieve a similar result and stop the vicious circle of frustrated customers opening new horizons for your business. 4. Your site is anti-social and hates mobile devices. According to Google, 2015 is the year of responsive design. In April of this year, Google has launched the new Mobile Friendly Algorithm update the main idea of which is that mobile-friendly websites are now ranked higher in mobile search results than websites not optimized for mobile viewing (learn more on the topic). Even if you think your clients aren’t looking for you on their phone (FYI, they are and from devices you don’t want to know), face it, they are definitely seeking you out on their tablet or tiny laptop. No matter what industry you are in, the bottom line is that you need to have a website that looks good on mobile devices, tablets, etc., otherwise, you risk your customers to be taken away by your competitors. 5. Your website is a bad business representative and a worthless salesperson. Your website can have an absolutely dramatic impact on your business. You aren’t there for your customers 24/7, but your website is, being that sales force which works nonstop to bring in your customers for you. Are you getting enough from your website? Is your website an honest and shameless representation of your business? Can your customers look at your site, find everything they need and understand your message clearly? If any of the above statements are true for you, it’s time to make a difference! Your website is an investment in the future success of your business, thus having a strong online presence is no longer optional. It can give you all the power you never had to achieve your goals and attract more happy customers. With almost 15 years on the web development marketplace, we, at Orange35, have been through hundreds of websites of all kinds of complexity and business types. Our professional attitude, process and high quality result vs price is mind blowing for our customers and we invite you to experience it yourself.